Broccoli, cauliflower, and cabbage are all members of the cruciferous vegetable family which are notable for their high amounts of glucosinolates. Glucosinolates are a class of compounds that work by releasing two anticancer compounds, isothiocyanates and indoles. These are the active compounds that prevent the activation of carcinogenic substances and are of critical importance in fighting the spread of disease. 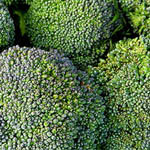 Specifically, broccoli contains an anticancer phytochemical known as sulforaphane. Sulforaphane increases the body’s ability to flush out toxic substances linked to the development of cancer, and is also capable of causing cancer cell death. Not only that, this substance is also believed to reduce the occurrence, number, and size of certain tumors. Indole 3-carbinol (I3C), another component in broccoli, plays a role in reducing cancer growth in those cancers which are estrogen dependent, specifically uterine, breast and cervical cancers. It is important to buy fresh vegetables and to make certain they are not overcooked in order to preserve the integrity of their anticancer properties. Avoid cooking the vegetables in large amounts of water because that increases the likelihood of nutrients being washed out. Steaming and stir-frying cruciferous veggies are highly recommended cooking methods in order to preserve high nutrient content.